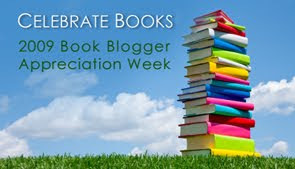 Deborah at Books, Movies, and Chinese Food is a participant in Book Blogger Appreciation Week. I enjoy reading her reviews and book suggestions. I grabbed the Meme so that I could share my reading habits with you guys. See if we share any and let me know what your are! I only snack if I'm hungry. Since I read before bedtime, I typically have some sort of junk food, but am extremely cautious so that my books don't get stained. Absolutely NOT!!! Absolutely horrifies me. Now, I do have to eat my words because as soon as I started reading Fearless by Max Lucado I began to wonder how I was going to remember all the profound statements by the time book club came up in the middle of October. Realizing I had no other option, I pulled out a pencil and have been lightly underlining phrases. I like using bookmarks from different authors. I keep a stack behind my bed and on my bookshelf. In fact, my kids all have a stack on their bookshelves also. Now, if for some odd reason I don't have a bookmark nearby, I'll grab whatever is near me like a scrap of paper. NEVER EVER dog-ear my books. I have been known to lay a book open. I know it's not good for the spine, but sometimes that's just how the book falls. Fiction preferably. I'm terrible when it comes to non-fiction. I have to think too much when I'm reading non-fiction. I can get lost in fiction, and that's what I love about it! I know as our world changes hard copies won't be the most prefered choice. For now, I love holding a book in my hands. I love the covers, too. As for audiobooks, I enjoy them on our trips cross country. They definitely help keep me awake on the long drives! I prefer to read to the end of a chapter, but it doesn't really matter to me. I like to end at a spot that seems natural. If I'm not at the end of a chapter, I always think I'll put the bookmark in facing the direction of the page I'm stopping on. Of course, I always go back and still have to glance around for a moment to find my place again. If I'm reading a book that needs defining of words, I'm reading the wrong book! I don't know that I've ever read, willingly, a book with words I couldn't define on my own. Blue Heart Blessed by Susan Meissner. Still have yet to read it. I'm a multi-tasker so for sure a minimum of 2 books being read at once. If you ever check me out on Shelfari, you'll see that I'm reading more than 1 book. I can read anytime, anywhwere. I love reading during the day, outside in the sun sitting on our adirondack chairs on the porch. That's only during the summer. At night I love to cuddle up in bed and dive into my books. I have a plan to build a reading corner upstairs next year. I've always wanted to have a window seat. They're so romantic! No preferance. I can read either. For sure Francine River's book Redeeming Love is the book I always recommend to others. Of course, if there's a genre people are looking for then I pull something out of that genre. For fantasy I recommend Sharon Hinck. Do you enjoy girls YA? Then I'd send you to Shelley Adina or Melody Carlson. For sci-fi YA I'd suggest Robert Liparulo. A great series, if you like them would be anything by Karen Kingsbury. Don't ask me about historical fiction. I'd never be able to pick just one author!! On my bookshelf, books are together by author (but not alphabetized) and then separated by Read and To Be Read (TBR). I also have a giveaway shelf surrounded by bookmarks that I also send with those books. Fun interview. Where is the link to read the interview that was done about you???? Nora, sorry, I wasn't thinking about the wording. Those are actually my answers, not Deborah's. I went back and changed the wording so that hopefully other readers will know those are my answers.